Blimp. Zeppelin. Airship. Regardless of technical differences the general media has for many years associated these with aviation’s most infamous of images—the Hindenburg plunging into a New Jersey airfield in 1937. The pilot was an Australian. Michael Nerandzic was a well-known figure in the airship community, with over 25 years and 12,000 hours of flying blimps. He was hailed a hero for remaining at the controls after delivering his three passengers to safety. He died; they all lived. But the report released in late 2013 by the German Federal Bureau of Aircraft Accident Investigation (BFU) suggests his sacrifice was unnecessary because the crash was unnecessary. Instead it was the culmination of decisions, practices and habits that in themselves were usually harmless but formed a deadly combination on the evening of 11 June 2011. The blimp had been stationed at Reichelsheim Airfield for several days conducting flights as part of a publicity campaign. Just after 1800 hrs, Nerandzic, who had taken over from the day pilot, took up three passengers for the eighth flight of the day. During the final approach at 2015 hrs, after ‘quickly descending’, the airship hit the ground in a field 450 metres away from the ground crew and anchor mast, with the impact described by the passengers as being ‘very hard’. The impact with the ground was so vicious it caused a high-tensile stress fracture of the airship’s single landing gear strut. With the landing gear collapsed, the gondola hit the ground and continued to ‘slide across the meadow for about 38 metres’. Flailing along the ground, the landing gear strut ‘pulled one hose of the drainage valve to such an extent that the cap on the gascolator* shifted and subsequently caused the heavy fuel leakage’. As the fuel spilled onto the central electrical supply it was ‘ignited by arcing originating from the electrical system’. (*The gascolator is a drain sump on the fuel line.) The tank was also ruptured. The blimp came to a halt about 430 metres away from the ground crew. 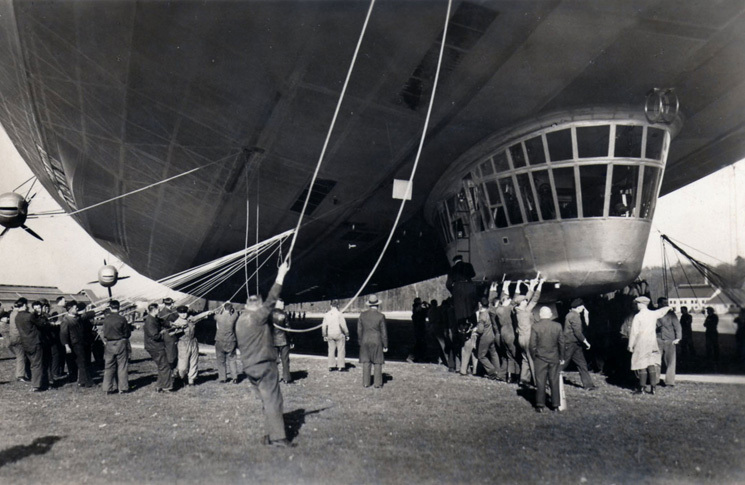 With a blaze now running up the side of the gondola, the ground crew ‘ran towards the airship to help (and) saw three passengers disembark from the gondola’, with Nerandzic remaining at the controls. ‘According to their statements the pilot supported them to do so,’ the BFU report said. With its weight reduced, the blimp quickly rose to 60 feet and the ground crew, running from over 400 metres away, failed to reach the mooring lines in time. The burning airship continued to rise to an altitude of 300 feet before the envelope started to deform, caving in moments later and sending the fiery blimp crashing back to Earth. Nerandzic’s body was recovered at the controls. The three survivors were treated for shock. Of the many findings detailed by the German investigators, a few stand out. One aspect was that communication between the pilot and ground grew was reduced to the pilot using his mobile phone to communicate via text message, as ‘there were problems with the microphone button which often jammed mechanically’. The American Blimp Corporation, which manufactured the A-60 model Nerandzic was flying, said his text message ‘implies the airship was overloaded by 15 ballast bags or 375 lbs (170 kg), respectively’ and was why the pilot ‘demanded 2200 rpm from the engines to hold the aircraft steady’. The blimp Nerandzic was flying was over-ballasted, a subtly but fundamentally different condition from being overloaded. An over-ballasted airship is not putting its structure at risk of immediate or eventual failure, as an overloaded winged aircraft is. But too much ballast can reduce flight control. Airships use ballast to take account of variations in lift, which occur for various reasons over a day, or even an hour. Airships are ballasted to be slightly heavier than air and to require some engine power to keep aloft. A maxim of airship aviation is that it is better to be a little too heavy than too light. This is to ensure that in an engine failure the airship will descend at a moderate rate rather than ascending uncontrollably. Another fact of airship life is that determining optimum ballast is a constantly shifting calculation. It depends on wind, temperature, humidity, the ‘freshness’ of the lifting gas from air contamination, and barometric pressure. Several of these factors can change markedly over a few hours, and the relationship between them is complex. The result is that few, if any, airship captains can hand-on-heart say they have never found themselves over-ballasted. The other pilot to fly the blimp said ‘the lifting capacity of the airship had been below the optimum that morning’. He also estimated that ‘due to the changed solar radiation conditions in the late afternoon the lifting capacity of the airship had been reduced further’ and during the accident flight the airship could have been overweight by ‘about 175 Ibs (79 kg)’. Despite this, when Nerandzic took over the blimp at 1500 hrs, ‘the filling volume, lifting capacity, fuel quantity and loading were not documented’. As if a warning for what was to come, the flight before the crash resulted in a tail strike and the loss of the rudder wheel. Although the chief of the ground crew and Nerandzic discussed the occurrence, it was not deemed serious enough to warrant suspension of the day’s remaining flights. Nerandzic was ‘informed of the loss of the wheel and advised that the landing gear bungees were not in the best of condition’. This relatively minor incident also highlighted the role of the wind in contributing to the fatal crash, which when coupled with the over-ballasted airship ‘resulted in an extremely difficult landing situation for the pilot’. When the wind dropped, Nerandzic had to make a powered approach at relatively high speed. When this went wrong the airship ended up landing heavily at enough speed to push its landing gear back. Individually, these occurrences might not have resulted in any serious or life-threatening situation. But combined, one otherwise negligible failure can mean disaster. As James Reason’s ‘Swiss cheese’ model says – ‘accidents are the accumulation of multiple factors and failures, where each may be necessary but where they are only jointly sufficient to produce the accident’. For Nerandzic, the reduced lifting capacity of the overweight blimp, coupled with the wind conditions and an inability to communicate fluently with his ground crew, proved fatal. Furthermore, despite experiencing a tail-strike on the penultimate flight and being ‘aware of the malfunctioning radio’, along with acknowledging ‘the loading condition in combination with the difficult landing conditions’, the flight proceeded. The investigation did not say whether commercial pressures were factors in the crash, although the blimp’s manufacturer said the fuel leakage ‘could have been avoided if the pilot had closed the fuel valve controller after the hard landing as is stipulated in the airship manual’ – despite the BFU finding that ‘a large amount of fuel leaked from the fuel tank’. The position of the fuel controller could not be determined from the wreckage. A Bureau of Air Safety Investigation (BASI) study looked at 75 fatal accidents and the role of human factors. While the report found ‘most accidents had more than one contributing factor’ it pinpointed that ‘over 70 per cent of the accidents involved pilot factors’ with the most common ‘related to poor judgement and decision making’. The report also illustrated the irrelevance of experience, as ‘errors of judgement are made by experienced and less-experienced pilots alike’. However, the report concluded ‘while pilot factors are of great importance, accidents frequently have their origins in systemic or organisational failings’ with ‘training, supervision, regulation (and) commercial pressures…involved in a significant proportion of accidents’. There was another way Michael Nerandzic could have been a hero. In its own way it would have been as difficult as the decision he made to let his passengers leave him alone in a blazing gondola. (As an experienced airship pilot he must have known what was going to happen next). He could have pointed to the ballast, the shattered tailwheel and the non-functioning radio and said words to the effect of ‘No, I’m not going’. He would have earned no eulogies for doing this, most likely quite the opposite. A reputation as an awkward customer, a stickler, would have been his. But he would have stayed alive. To know my uncle could’ve have survived and lived from the accident is slightly disturbing, just imagining him being here now, I just can’t I really can’t, seems like almost a century ago since I last saw him on the same year in the U.K., uncle mike was one of the big pushers in my life decisions even before his death, he died a hero is all I could say, go down without a fight your dead for good, go down a hero and you will live on, there is one slight problem with this however, he always thought the up most of the people around him, he never got a split second would say “wait no that’s mine give it back” when I was a child, he really wanted to just have a good life, which he did, just a shame he can’t be with me and my family today.